We've seen some good headsets from Asus in the past, but they tend to be high-end models like the £220 ROG Centurion 7.1 with its true 7.1 surround sound. Of course, not every gamer can stretch their budgets that far, so looking to cater to those with more restrictive wallets, Asus has the £100 ROG Strix Fusion 300. That's still not a cheap headset, but nor is it silly money. The Fusion 300 is all plastic on the outside, but it's well built nonetheless and feels like it has metal at its core. 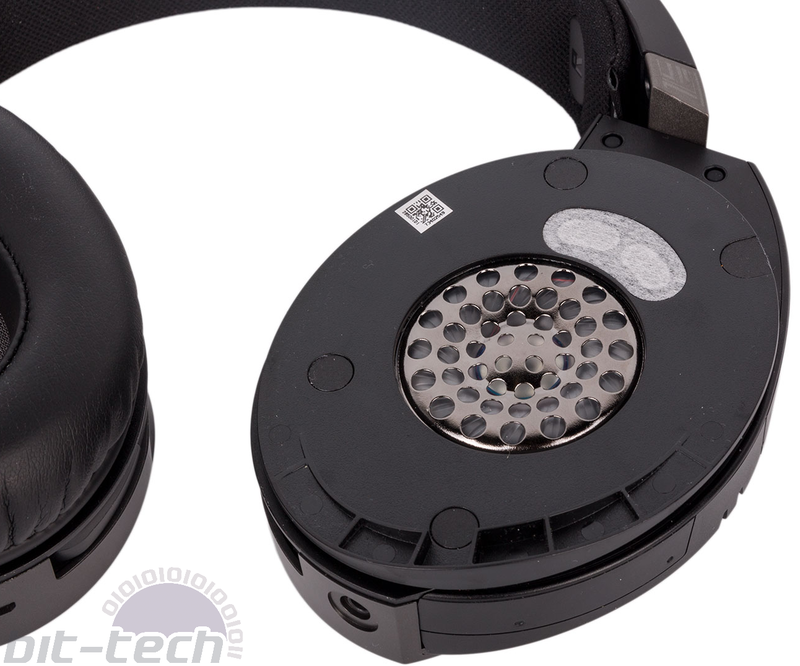 In fact, you can expose some of the inner metal when adjusting the height of the earcups. Thick, wide padding on the headband distributes the weight of the headset well, and this is undoubtedly a good thing, as the Fusion 300 is noticeably heavier than something like the HyperX Cloud, for example. 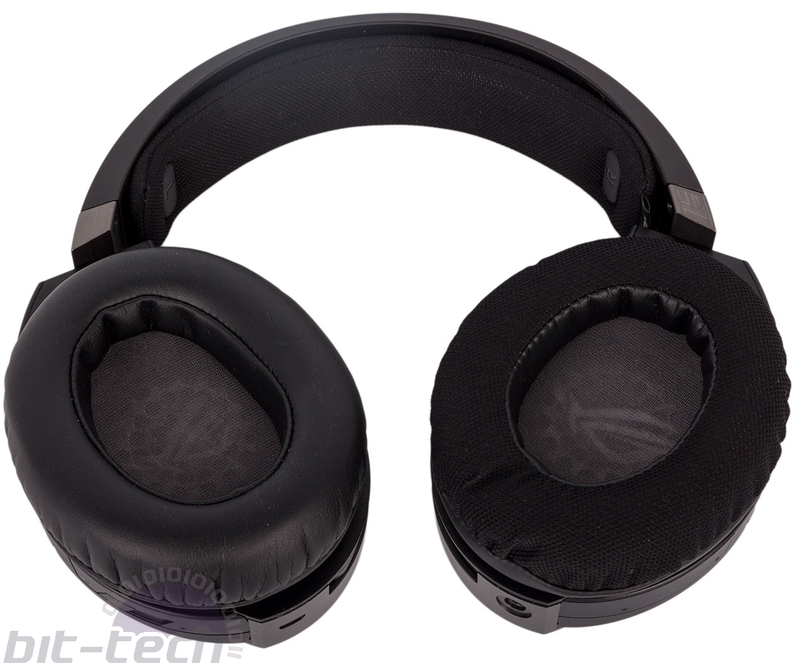 Faux leather ear cushions are fitted to the earcups by default, but included in the package as well is a pair of so-called ROG Hybrid cushions made of a hybrid material that includes protein leather and fabric mesh to strike a balance of breathability and sound retention. I prefer faux leather coverings for the most part, but I was impressed by the alternatives here, and there's a slight added firmness to them that may appeal to some as well. Either way, there's an abundance of foam, and this plus the oval shape of the cushions and well-judged clamping force makes the Fusion 300 very comfortable. The Cloud headsets still win here, at least for me, but this comes close, and I'd happily wear it for long sessions without fuss. Changing the ear cushions is a simple enough process that involves you tucking some elasticated leather under the outer edging. Once you have the first bit in, you just work your way round and you're done in seconds with only the occasional bit of fuss. Also of note is the fact that the earcups themselves can turn inwards for easier flat-packing and transport. The Fusion 300 offers both USB and 3.5mm jack connectivity, although the latter is a mobile-style single jack, so PC users who want analogue sound will need to provide their own adaptor. 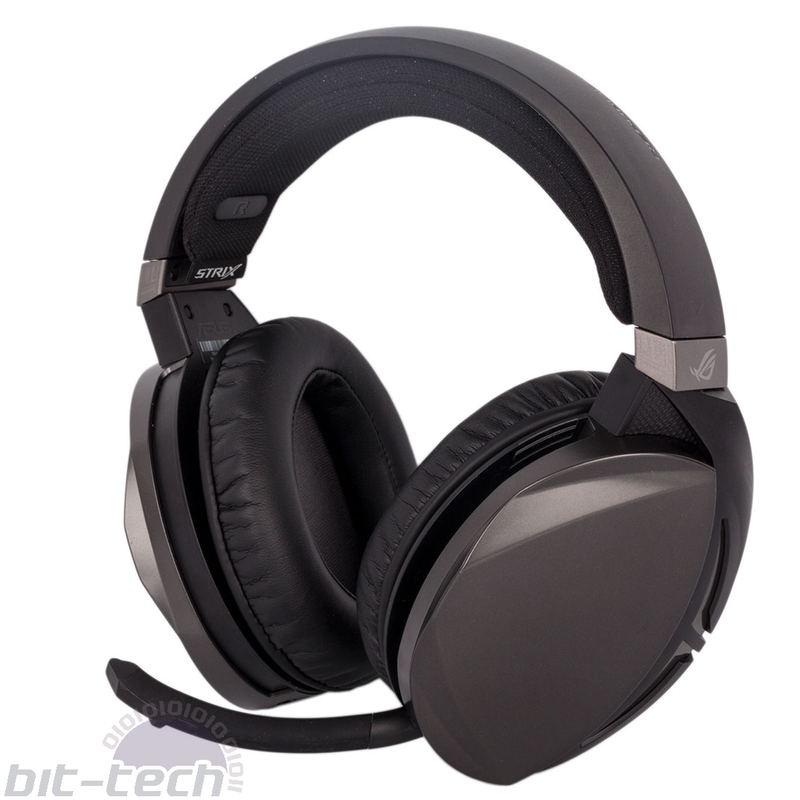 Evidently, the aim is to have PC users go for the USB connection, and this will bring more volume, virtual 7.1 surround sound as an option, and LED functionality to the earcups. Both cables are braided, and both can be detached, with the USB one using a micro-USB connector on the headset side. A button on the back of the left earcup toggles the virtual 7.1 surround sound. The microphone mutes automatically when flipped back up into its housing, so no mute button is needed, but the ROG Strix Fusion 300 does lack onboard or in-line volume control. Now, most apps and games have their own volume control, as do many keyboards, but this is still a notable omission. The microphone itself is not the easiest thing to bring down, but it does tuck away neatly. It's also quite short, but we found it had no trouble picking up our voice, and it's flexible too thanks to its rubber spine. Voice clarity is high, even when background noise is loud, although the microphone doesn't do much to block this out, and its sensitivity seems quite high, which does lead to some hiss on the line. Still, it's easily serviceable for calls and team chat. Asus is using its own Essence drivers, which are 50mm neodymium models. They have an exclusive airtight chamber design and a metal cover rather than a more traditional plastic one, both of which are said to boost sound quality. It's a believable claim, as I really enjoyed what was on offer regardless of what I threw at it. Highs aren't quite as crisp or detailed as they are on the Cloud, but in turn the Fusion 300 has better bass response. The mid-range is satisfying too, with crowded metal tracks retaining distinction between the various elements. Bass can be a tad dominant, but I'd describe it as bass-driven rather than overly bass-heavy like cheaper gaming headsets can be. Some acoustic tracks had a slightly too powerful low-end, perhaps, but this is primarily a gaming headset, and there it serves very well indeed; it just thankfully doesn't sacrifice general sound quality to do so. You can also use the ROG Hybrid earcups, as these provide a slightly less bassy sound. It's not all good news, as both the USB and 3.5mm cables can introduce quite substantial noise to the mix when rubbing against your clothes, and this applies to microphone recording too. This could easily have been solved by Asus just including a simple clip, so it's a shame there isn't one. The virtual 7.1 surround sound is the same as always: mildly effective in suitably mixed sources but terrible when trying to upscale stereo sources including music. Thankfully, it's dead simple to switch on and off with the plug-and-play functionality offered by the toggle switch. 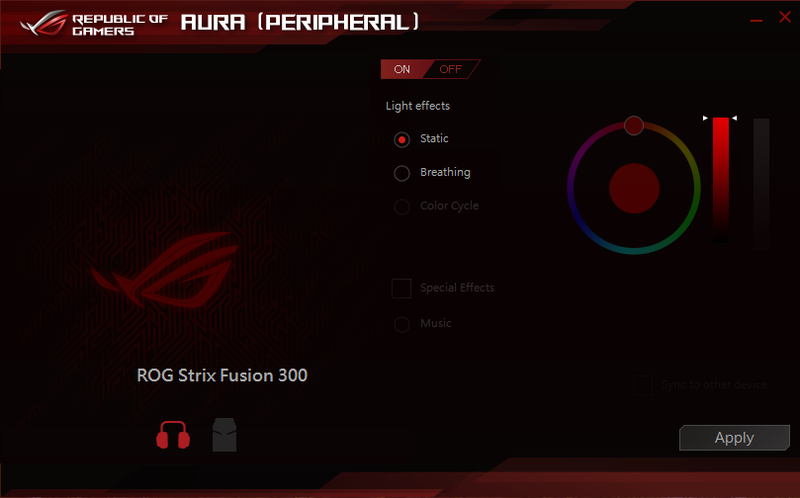 There is some software available for the ROG Strix Fusion 300, but it's only for controlling the LEDs. Contrary to Asus' current hardware trend, these light up red and red only; the software merely allows you to turn them off, dim them, and set them to a breathing effect. We really would have liked RGB LEDs here, if only for consistency with Asus' other hardware, but we understand that these are being reserved for the higher end Fusion 500 and Fusion 700 headsets. We're used to Asus headsets sporting more features than we care to count, but the ROG Strix Fusion 300 is evidence that the firm has a deft hand for simpler designs too. Onboard volume control and RGB LEDs would have been nice, especially the former, but otherwise this headset ticks most of our boxes. 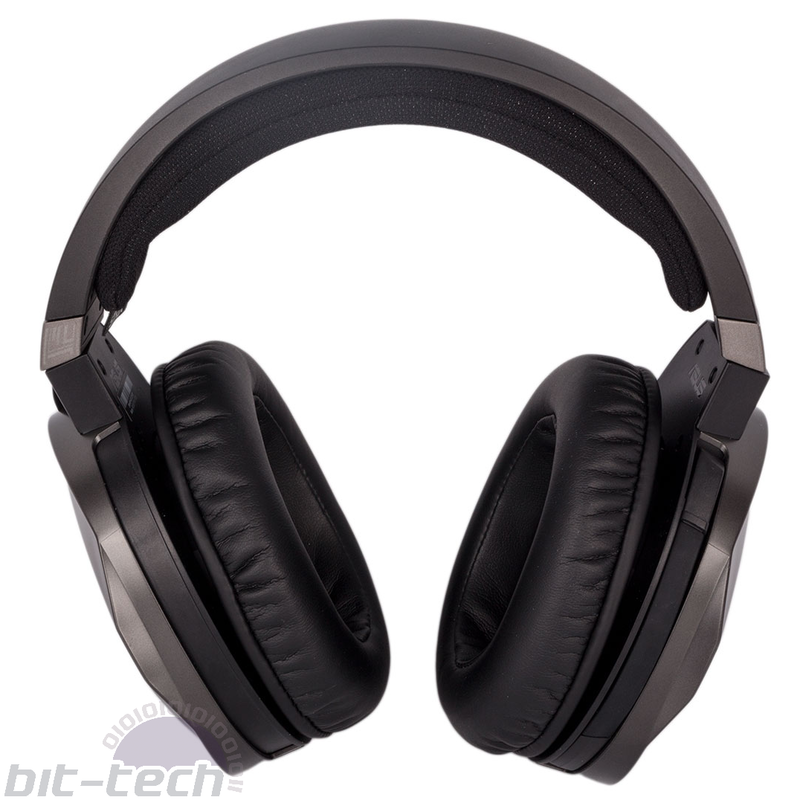 Comfort is very high, even if it is quite heavy, and sound quality too is excellent and has clearly been a real focus. From a pure gaming perspective, I'd even say it's better than the HyperX Cloud and Cloud II, and regular readers will know that I don't say that lightly. A few niggles with the cable rubbing, the lack of volume control, and the absence of some handy but not critical accessories (3.5mm splitter and cable clip, for example) hold it back from our top award, but this is still probably our new favourite £100 headset.